“The quest for our dream wedding began in Feb 2015 when my Mum and I booked tickets for the wedding show at the NEC to get some inspiration as Lee & I had no fixed ideas for the venue for our wedding. The day, although enjoyable, provided nothing to fire my imagination. Towards the end of the day, over a glass of prosecco, my mum mentioned that she had a friend who had previously used Lisa Redgrave to help plan their Italian wedding. As soon as I got home Lee & I looked on the ‘Hitched in Italy’ website and we were both overwhelmed at the beautiful venues on offer. 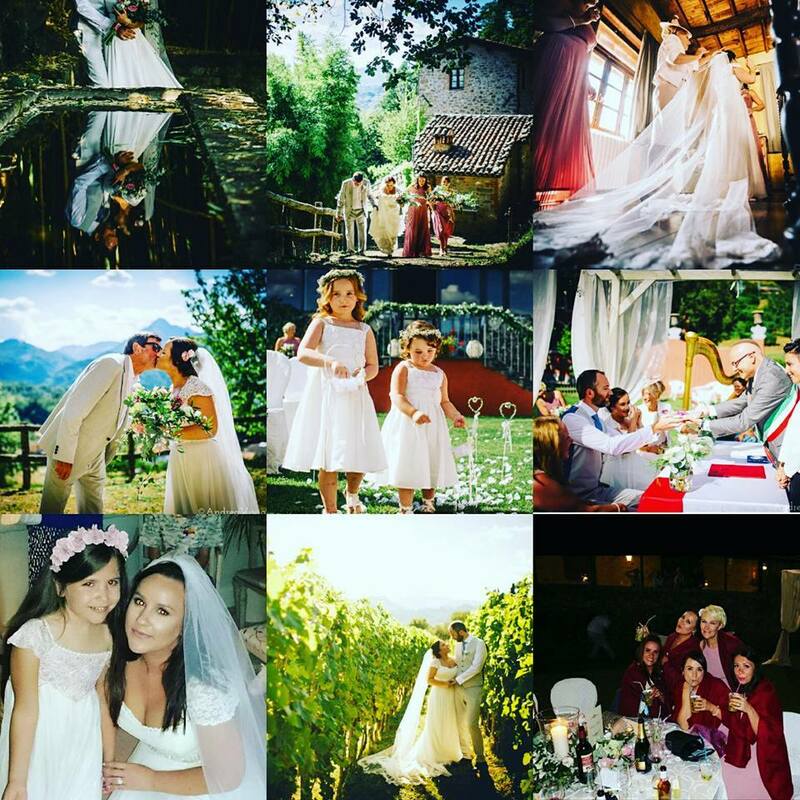 We were excited at the thought of getting married in Italy, we had no link or reason to get married in Italy, like some couples, we just wanted a stunning wedding in a beautiful location, which Lisa certainly gave us and more. Lisa came to our home and listened to all of our ideas on how we envisaged our wedding to be. She then showed us details of the variety of venues available ranging from small and intimate to the larger, more luxurious properties. Once we had been shown our venue it captured our hearts and our decision was made! However there was the huge matter of cost, could we afford such a magnificent venue? Surely it would be out of our price range? But of course Lisa came up trumps and for a very reasonable and affordable price we could have exclusive hire for accommodation and a wedding venue for the whole week! We were given ample time to think things over before we signed on the dotted line and in the meantime Lisa provided us with as much information as we could possibly need and making helpful suggestions. My parents made a trip to Italy in their motorhome 6 weeks before the wedding and took a variety of personal wedding decorations to the venue. They met Lisa at her home in Tuscany close to ‘I Cedri’ and were then taken to view the property. They were totally blown away by what they saw – a large gated estate which overlooked the most stunning scenery with views of Barga in the near distance. The accommodation was amazing too with 2 swimming pools, one of them an infinity pool blending into the mountain view. They also met the owner, Danielle, who was so charming and friendly. All of my parents anxieties were laid to rest and now we could all look forward to our wedding with ever growing excitement. Lisa was so positive, trustworthy, reassuring and full of knowledge throughout the whole planning procedure. We had many face to face meetings as well as being available through email or phone. Lisa sorted out all of our legal paperwork in Italy and our pre wedding meeting at Barga town hall, she arranged the hairdressers, flowers, musicians, the DJ who was also a fantastic saxophonist, an outstanding professional photographer to suit our budget. On the wedding day Lisa took control of setting up the ceremony area and the reception tables and decorations. The whole day ran smoothly from start to finish with Lisa’s excellent organisation skills. The food was amazing, beginning with canapés and prosecco in the olive orchard to an incredible 4 course meal served in the garden overlooking Barga and the mountains. The staff were excellent, nothing was too much trouble. Lisa really did go above and beyond but not just for the day, for the whole 18 months and wedding week. Lisa arranged for our guests to go to a wine tasting afternoon at a local vineyard. She organised my Italian hen party which was a lovely meal in a fantastic restaurant in the middle of Barga. All transport for outings (a small bus) and taxi’s for guests who didn’t hire a car in Italy were all sorted through Lisa.